FLAT IDLER PULLEY for JOHN DEERE AM102323, John Deere AM32705, TROY BUILT, Huffman, Lawn-Boy, Simplicity, Toro and more listed. 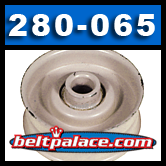 Home > Lawn and Garden > Lawn Mower Idler Pulleys > Idler Pulleys for your John Deere Mower > 280-065, FLAT IDLER PULLEY for JOHN DEERE AM102323, AM32705 and others listed. 280-065, Lawn Mower FLAT IDLER PULLEY for JOHN DEERE AM102323, AM32705 and others listed. FLAT IDLER PULLEY for JOHN DEERE AM102323, AM32705 and others listed below. This Idler Pulley replaces: ALLIS CHALMERS 1708030, ALLIS CHALMERS 2026082, ALLIS CHALMERS 2028960, DIXON 1751, FMC 171-3803, GILSON 6588, JOHN DEERE AM102323, JOHN DEERE AM32705, LAWN-BOY 701070, LAWN-BOY 702815, MTD 756-0217, MTD 956-0217, NOMA 32753, NOMA 40223, SIMPLICITY 154534, SIMPLICITY 154534SM, SIMPLICITY 156124, SIMPLICITY 156124SM, SIMPLICITY 1603515, SIMPLICITY 1603515SM, SIMPLICITY 1610191, SIMPLICITY 1610191SM, SIMPLICITY 2154534, SIMPLICITY 2154534SM, SIMPLICITY 2154534SM, SIMPLICITY 2156124, SIMPLICITY 2156124SM, SNAPPER 1-4153, SNAPPER 7014153, TROY BILT 1713803, TROY BILT 956-3054.